Add an acetal packer to under a Ronstan RF7 central cleating swivel block mount to lift the block up from the cockpit floor. Useful when the mainsheet fouls the hiking straps or when the lead into the cleat is too low. 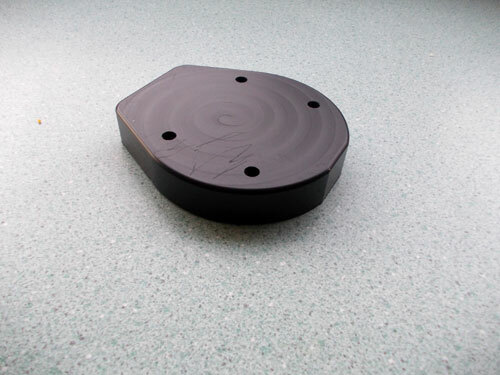 Be mindful that the backing plate under the floor can be loose and as such always have at least one bolt in to keep the backing plate in position under the floor. Remove three of the mounting bolts and loosen the fourth. Swing the Ronstan RF7 Swivel Block Fitting out of the way. Reinsert one of the bolts back through the floor to hold the backing plate in place. Remove the fourth bolt and lift the Ronstan RF7 block out of the boat. Fit V-Tech_355 pad under the Ronstan RF7 fitting and loosely fasten one bolt through the floor onto the backing plate (check bolt length and purchase longer ones if required). Remove the bolt holding the backing plate in place. 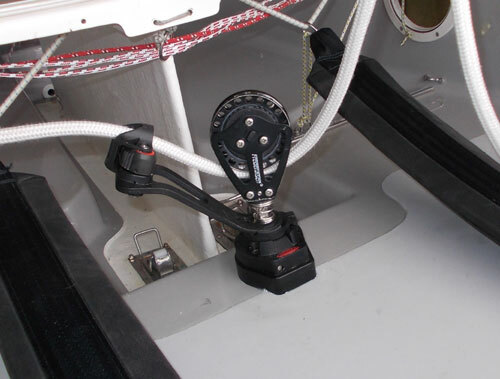 Line the pad and swivel base with the remaining three holes, fasten bolts, re-rig the mainsheet and go sailing.